GB: Tell me why you chose the crescent moon. RA: When you asked me to pick something beautiful, I did a quick scroll through my Instagram, which has become my filing cabinet for beauty, and I noticed I had all these moon pictures, and that most were crescents. I have joked with my friends about my “moonstagrams” before, but this was borderline obsessive. Like in a cop show where they break into the killer’s apartment and find pictures of the victim everywhere. Part of my moon love is dispositional. If you’re a nocturnal person like I am, the moon has a lot of appeal. It plays to what Don DeLillo called the “night side of the mind,” the creative state associated with magic and the poetic imagination. There is a duality to the moon that I also find appealing. Like all celestial bodies, the moon is otherworldly, in the sense that it is situated outside our world, and in the sense that it is a world unto itself, an alien place with it’s own landscape and sky. But for all its foreignness, the moon is also an intimate companion, of the earth, of course, but also the human mind. In fact, that’s one of the dominant ways you see the moon represented in poetry, as a friend for the lonely. It’s so fascinating to think about our collective experience of objects in the natural environment—things like oceans, trees, mountains, and various celestial objects. It’s interesting to see how different cultures depict those objects in art and literature, especially in the mythological imagination, where they tend to be imbued with all kinds of revealing agencies and origin stories. For me, the crescent moon is particularly intriguing on that score, because it tends to be associated with the passage of time. And time is something I have a deep interest in, philosophically. But that’s not why I picked the crescent, or at least it’s not the main reason. I picked it because of the feeling it gives me. It can sneak up on you, the moon. It’s not like the sun, whose presence you always register, even when it’s hidden by the landscape. You can be outside for a long time at night, without seeing the moon. You can walk for a while and not even notice it, but then all of a sudden it’s there, between tree limbs or on the horizon, and it just rips you right to the raw edge of experience. GB: I was slightly surprised that someone who knows so much about the rest of the cosmos chose something so close to us. Did the moon inspire your interest in astronomy and space exploration? RA: It’s funny you say that, because I went back and forth between picking the moon and picking the Ultra Deep Field, a Hubble image that reaches thirteen billion light years into space. But in the end, it was the moon’s nearness that tipped the scales, because it feels like it’s ours in a way that most other objects of the sky don’t. There might be many places in the cosmos where intelligent beings have evolved to stare up at starry skies. And a lot of those alien skies will have moons, but they won’t look like our moon, because our moon bears the scars of a very particular history—a history it shares with the earth. And its size is special, too. Not because it’s especially large, but because it’s 400 times narrower than the sun and, by a strange coincidence, 400 times nearer too. That’s why the two are roughly the same size in the sky, and also why we have such stunning solar eclipses. The universe is vast and star-filled, and so I’m sure those conditions obtain elsewhere, but perhaps not very often. GB: In your recent essay about Star Axis—Charles Ross’ massive work of land art in the New Mexico desert—you discuss the idea that science is actually making the world more mysterious, not less. Do you find beauty in that sense of mystery? RA: I do find beauty in it, although I should pause to say that it’s not the case that more mystery always equals more beauty. Amnesia, for instance, seems like a pretty mysterious experience, but it’s not clear that it’s an especially beautiful one. Having said that, I feel lucky to be alive right now, because I think we’re living in a goldilocks era for mystery. If you look back at the last 100 years, it’s astonishing how much we’ve learned about the cosmos. We know what it’s made of and how old it is. We know its general structure, down to a pretty granular level. We know a lot about its future. But there are also these huge questions staring us in the face, questions about the nature of consciousness, questions about dark matter and dark energy, what came before the big bang, why there is something rather than nothing, and so on and so on. Those mysteries can take on an existential tinge if you take them deep enough, and that can be bewildering, and even dangerous, to a certain sort of mind. But they can also animate the world with a shimmer of possibility. After all, we might see truly transformative discoveries in our lifetime. We could find intelligent life elsewhere in our galaxy, or we could prove the existence of a superstructure that transcends the observable universe, like the multiverse. Either of those findings would have profound implications for our cosmic narratives, the stories we tell ourselves about how human beings are situated in the wider world. And that’s what I mean by a goldilocks era. We have enough mystery around to make the human experience utterly fascinating, but not so much that we’re constantly in danger of descending into madness. You can see a small-scale version of this with the moon, and our theories about its origins. Some people think it’s a blasted off chunk of the earth. Others think we snatched it from another planet. Still others think the earth and moon formed as a pair, in the primordial days of the solar system. The fact that we aren’t sure gives the moon a kind of glamour, I think. Every time we see it, we’re reminded that there is so much that we still don’t know about this world. GB: Sometimes I wonder why we find the moon so beautiful when we know there’s not much going on up there! RA: It’s true the moon is barren, in the sense that the lunar surface itself is lifeless. But I think it’s important to remember that the moon is part of the earth system, and that it’s more than a decoration. Its presence actually steadies the earth’s tilt, keeping our climate relatively stable, and its orbit influences the tides of our oceans, affecting billions upon billions of living things, including us. The moon is only lifeless and dormant if you see it in isolation from the earth, and I am not sure that’s the best way to see it. GB: Has the moon inspired any kind of religious feelings? RA: Oh yes. In fact, the moon has inspired so many religious feelings that it’s probably best if I stick to those inspired by the crescent. Think of the Islamic star and crescent, a symbol whose roots reach back to the moon gods of Sumer and Babylon. Or the Hindu god Shiva, a deity who wears a crescent on his head, an ornament that is meant to symbolize the waxing and waning of creation during time’s eternal cycles. That association gets nearer to what I find so compelling about the crescent moon: its connection to the cyclical nature of time, the concept of eternity, and the idea that everything is in flux. The crescent can be a powerful symbol of possibility and becoming, because it promises the full moon, the wholly illuminated disc. But it can also wane into nothingness. That symbolic relationship, between time and the moon, might be a relic of ancient intellectual history. One of the most profound shifts in human thinking, on par with the revolutions launched by Copernicus and Darwin, occurred when we began to situate ourselves in time. And we know the moon played a big role in that shift, because the first calendars were based on the lunar cycle. That has to be one of the more consequential encounters between the moon and human consciousness, and it wouldn’t surprise me if the crescent commemorates it in some way. But that’s just speculation. GB: Are the moon, the earth and the cosmos more beautiful to you, the more you know about them? RA: I think so. The more you know about how nature works, the more you see the intricacy of its machinery on every level, from the subatomic to the cosmic. And when you realize that the whole complex edifice emerges from relatively simple laws, that definitely lends a glow to nature that could reasonably be called beauty. Richard Feynman had the last word on this in his famous riff on the beauty of a flower, as seen through the eyes of a scientist. He said the untutored eye could only grasp the surface level beauty of a flower, whereas the scientist can see it at much smaller dimensions. The scientist can understand its inner structure and the workings of its constituent cells. And the scientist can see the flower in the context of its ecological relationships, the effects it has on other organisms, and so on. I think that same logic applies to the moon and the wider cosmos. But I also find it fascinating to think about how prescientific and prehistoric cultures experienced the moon. What did the Neanderthals and other early hominids make of it? And what about animals? Obviously there are species that bumble through their whole lives without so much as glancing at the sky. But animal consciousness is so poorly understood, you can’t help but wonder if the more intelligent ones take notice of the moon, or follow its phases in some rudimentary way. GB: Do you think it’s a big deal that man has walked on the moon? Does that fact that we can reach it now enhance its beauty? RA: I have read people who say the Apollo missions demythologized the moon, but I don’t buy it. If anything, the moon landings re-enchanted the moon, by giving it a prominent new place in the larger human story. If you ask people today whether our species will eventually travel to the stars, most of them say yes. If you’re working within that larger narrative, the moon landings take on an extra layer of significance. They become the first step in a truly cosmic journey. GB: What makes something worthy of the word Beauty to you? I was born on a New Moon, which occurred during an Eclipse AND a hurricane… Even the words tend to make me stop in my tracks. 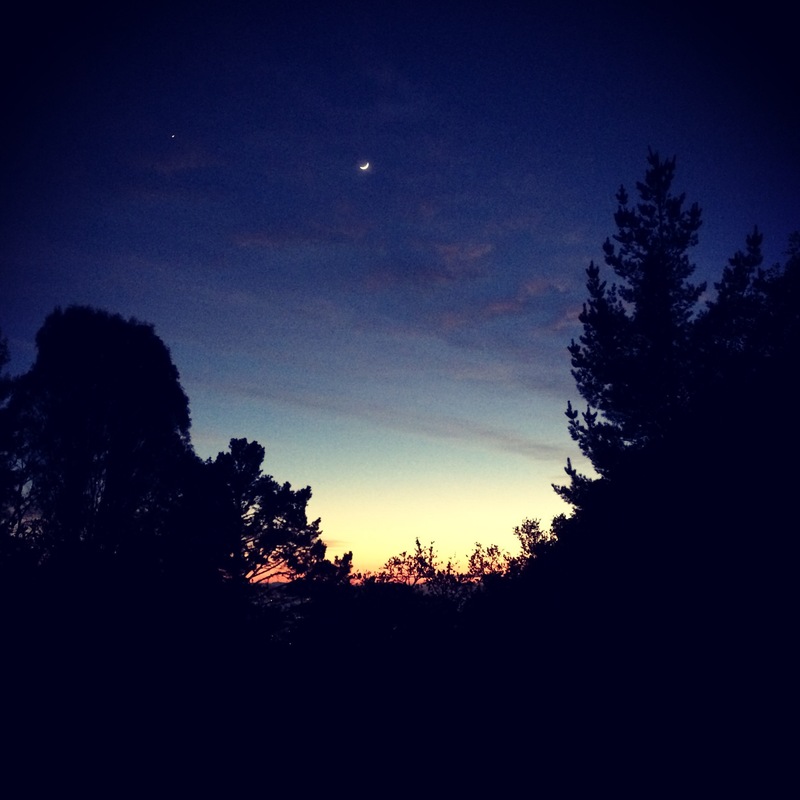 Seeing a New Moon in a clear sky is beauty beyond measure… thanks for this post! What a beautiful picture! Thanks for sharing. You sure have a great talent! So perfect…I’ve always loved the moon, too, and stars! I think you capture here why that might be, with the moon, very well. nice picture,moon such a admiring one .While seeing the moon it makes me pleasant as well as cool. Wonderful post, I like the waning moon before the New one appears, I think it is full of promise. wow. this was amazing. i felt so inspired while reading, you have an amazing natural talent in the use of the English language, and you are so philosophical. it really brings some things to light id never considered about the moon before. it was a truly enlightening read. This posts captures much of what I feel about the universe and the Moon in particular. A very interesting read! Thank you for posting! As I read this, I looked up to see the crescent moon above my computer. I have always loved looking at all of the phases of the moon and will stop in my tracks to gaze. But now, I will look at it with enhanced appreciation. Lovely post. Thank you! I tried to photograph the crescent moon at sunset last night but the light behind was too bright in the sky. I really enjoyed this post. Being energy aware it is also interesting how the phases of the moon can influence how we are feeling. Both individually and as our collective human experience. Thank you! such a beauty it is! Aww this is beautiful! I find the moon — the crescent moon in particular — so very alluring and beautiful without measure. I am also enamoured with the moon. Watching it is hypnotic at times. Thank you for posting this. Beautiful pic!! Hope you see also My blog ! This post is beautiful. I love its language and the idea behind it. Thank you for writing it! This is a beautiful piece on the moon. I love the crescent moon too. A couple of weeks ago, a beautiful crescent moon, accompanied by Venus (I think) was visible in the early morning sky here in southern Florida. I tried to take a photo of it, but you did a far better job of that! I’m a bit of a junior philosopher (my friends look at me like I’m crazy when I spout my inner wisdom, I seem like the inpaitient type, not the thoughtful type) so this actually spoke to me in a way. Loved the post! Thank you!